Stiphidiidae are generally medium size spiders, body length 5-11mm. Stiphidion spp. 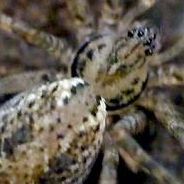 make a horizontal tent-like web under rocks, also on bark or buildings, other stiphidiids either make a sheet web or web unknown. Most species are speckled brown with long legs. All members of this family, except for one in Madagascar and one in Mauritius, occur in New Zealand and Australia. Stiphidion is the usually the most commonly observed Stiphidiid genus.